Bump has only been available for download from the App Store for a month, but already the social networking app has secured a place in iPhone app history. Bump became the one billionth download from the App Store when a Connecticut teenager selected the free app on Thursday. It’s a pretty fortuitous turn of events for an app that aims to help you exchange contact information by bumping your iPhone or iPod touch with another user. Bump is the first App Store offering from Bump Technologies, the brainchild of ex-Texas Instruments employees David Lieb, Andy Huibers, and Jake Mintz. I spoke with Lieb for a little bit on Friday and found out the origins of Bump. A first year MBA student at the University of Chicago Booth School of Business, Lieb said he was always jotting contact info into his iPhone when at school. Lieb contacted Mintz and Huibers and the company was born. There was however, one problem. Huibers, the programming brains behind the project, didn’t have a Mac and had never programmed for any Apple platform. “Andy bought a Mac the next day and he had the basis for the application done within a week,” said Lieb. The finished product exchanges contact data between two mobile devices over any type of wireless connection. Both users open Bump on their respective phones and then, holding the phones, gently bump their hands together. There are actually two parts to the swapping of information—the app running on the iPhone and a server in the cloud. In its simplest form, when two phones literally bump, they send the information to the server—the server then uses an algorithm to match that bump to another phone in the cloud. The users are asked if they want to swap information and once confirmed, the info is swapped, saving the new contact data in each user’s respective address book. 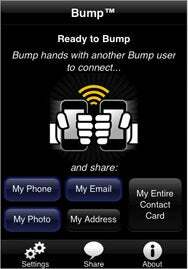 Bump Technologies has big plans for Bump and the technology used by the app. A paid pro version of the app is in the works, promising the ability to send photos and multiple contacts; look for it in the next few months. The company is also looking beyond the iPhone and contacts. Bump will be available for other platforms like Google’s Android and the BlackBerry. The hope is that users of all platforms can exchange information using the Bump technology.